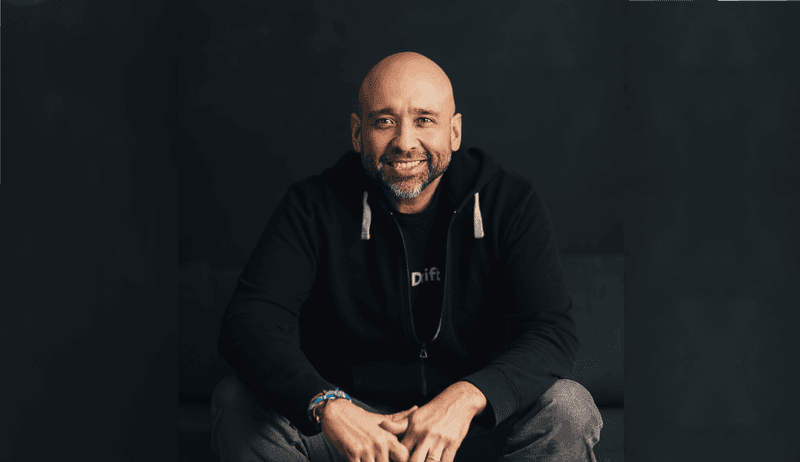 For this fourteenth episode, I talked to David Cancel, Founder & CEO of Drift, a leading conversational marketing & sales platform. Drift is not David’s first baby, nor his first success story. He was previously Chief Product Officer at HubSpot after his company, Performable, was acquired. Before that he also launched and sold Ghostery, Lookery and Compete. We talk about his backstory, how he likes to build both startups and flowers, why he is still involved in every single hire… and why he doesn’t believe in development sprints. Jeroen: Hi, David. It’s great to have you on Founder Coffee. Jeroen: Me too. You’re the founder of Drift. We all love Drift. Jeroen: But for those who don’t love Drift yet, what do you do? David: So Drift is a SaaS app and it helps people. It lives on your website and basically is like taking your best sales rep and making them available 24/7, all 365 days. We do that through conversational marketing and a bot that has conversations with the people that come to your website in real time. Jeroen: Yeah. So when I hear live chats, I hear chat bots somehow. Jeroen: You mentioned sales. So it’s kind of the target market you’re focusing on. Is it like sales, live sales? David: Yeah. It’s sales. Many people had tried to use live chat for sales forum. For at least the last decade or so, they weren’t successful because they weren’t using a support tool in order to do it. What we did was, we’re the first to bring bots to live chat in order to just be able to do sales with real-time qualification, real-time routing, all that kind of stuff. So we define this category as ‘conversational marketing’. But yeah, we do chat. We do email. We do basically everything that has to do with a conversation. So it goes beyond chat. It goes into the email and other places. Jeroen: So it’s also a marketing automation tool and somehow a sales automation tool. David: It’s a sales and marketing automation tool, right? We believe that marketing and sales is coming together. We’ve been trying to do that for a long time. We’re organizing them around two things, conversations and revenue. So we’re a platform that lets them do that. We all know that if you have salespeople on your team, no one’s going to be able to sell anything until they have a conversation. The salespeople and marketing systems and automation and all that stuff, for years, has been focused on putting hurdles between you, the prospect, and the salesperson. What we do is remove those hurdles and create like a fast pass direct line between that prospect and the salesperson. Jeroen: Now, is this a sort of, how can I say, a sort of an issue that grew on you when you were with HubSpot or how did this come about? David: Yes. So as you mentioned, I was the Chief Product Officer at HubSpot before this. So I ran product engineering, all that stuff, CRM, built sales products, built all the marketing products. It didn’t have the idea then. When I left right around the time we went public as a company. I was looking at messaging and the reason I was looking at messaging was that I was fascinated with the way that it was being adopted. It had gone from just geeks like me using messaging to everyone in the world using messaging as the first thing that they wanted to use. So I was fascinated by why that was happening and why that was empowering companies like Slack and other companies to grow so quickly. So I was looking at that and I would say I was obsessed with that. I didn’t know how it was going to build, what kind of products that we were going to build because of that. But I just knew that maybe the time was right to finally do something with messaging and sales for the market. Jeroen: So it’s more like Slack, but done externally. Jeroen: Cool. You mentioned you were at HubSpot before. Jeroen: Is that the first startup you were ever involved in or were there others before? Where did it kind of start? David: Yeah, no. There’s been many. So I started four companies before starting Drift. One of those companies, my fourth company, Performable, was acquired by HubSpot in 2011. That’s how I got to HubSpot. I had sold all the other companies, the three others before that, but I had never gone as part of the acquisition. I had always made it a point to leave and this was the first time that I had gone. So I went into HubSpot when we were around $30 million in ARR and around 200 employees. Then I left when we were over 100 million and going public. We were I think 1,200 employees at that point so we added a thousand people in the time that I was there. Jeroen: Yeah. So can you give us an idea what your first startup was? David: Sure. It was so long ago. I was a part of two startups before I started my own and those were in New York. But the first company I started on my own was in November of 2000. So 18 years ago. David: Yeah, a long time ago, almost 18 years ago. That company was called Compete. We sold that company in 2007 to WPP which is the world’s largest marketing PR kind of conglomerate based in the UK. What we did at Compete was it was pretty much SaaS but that didn’t exist as a category back then. We called it like eCommerce for business or some crazy dumb idea, because we didn’t have a category. What we did was we sold marketing intelligence onto mostly Fortune 100 companies at that point although we had a freemium offering as well that people could buy. It was just a crazy time because basically, you could use Compete to figure out how you were doing relative to your competitors. So you can use tools like Alexa now and lots of other kinds of competitive intelligence tools. But at the time, none of those existed when we started Compete. Jeroen: Yeah, so it was like a very exclusive thing to see how your website was doing as compared to others. David: Yeah, exactly. We competed with Nielsen and comScore and a couple of companies like that, big companies. Basically, you would buy it to understand not only how much traffic you were getting and traffic sources and all that stuff that you can get on analytics, but to get real insights on why were people making the choices they were. It gave them insights into how and what they could change in the strategy to be able to attract those people. All sorts of stuff like that. In the beginning, it was a freemium type product but no one was buying freemium at that point. You got to remember, in 2000, people were barely buying books from Amazon, right? There was not much happening. Not many people were putting their credit card online if you can believe that, 18 years ago. So we had to pivot the company a little bit and really focus on this Fortune 500, Fortune 100 type of customer. So super expensive. They would pay us on average $350,000 a year per subscription and many of those were a multimillion dollar a year subscriptions. We would sell to all the travel companies you could think or finance companies. Later on, before we got acquired, our biggest customer was Google. We were selling to Google and eBay and Microsoft and all those kind of tech companies you could imagine but before that, it was really travel, automotive – all the car companies, finance and all sorts of verticals like that. David: Yeah, WPP was and is, the biggest communication services company in the world. I think that is what they call themselves. But they own PR, they own market research. They own all that kind of stuff. They own hundreds if not thousands of companies. What they wanted was our ability to see what was happening across all of these clients that they had. So we had that competitive intelligence data that no one had and served them kind of an unfair advantage in their client work but also in the strategy work that they were selling to those massive companies. Jeroen: Got it. Now, what was your second startup about then? David: So many. The second startup was called Lookery. That was almost like an accidental startup. I left Compete when we sold it. I wasn’t doing anything. I was just hanging out. Me and a friend kind of accidentally started this company. We weren’t actually trying to start a company. It was during the summer of 2007. This was also the time when Facebook launched their platform. So this was the first time Facebook had launched their platform. They were, if you could believe it, a couple of hundred million people using Facebook at the time, versus where we are now, billions. We had all of these friends that were building products, apps, on top of Facebook. David: Yeah. There was everything from games to horoscopes to everything you could think of. There were a million different things. Later, it just became games. But before that, it was everything you could think of. They just happened to be friends of ours, we knew all those people. Some of those companies later became companies like Ziinga and other companies that went public. But before they did that, they didn’t have a way to make money and so we created this advertising network called Lookery and to help our friends make money, we sold that advertising network to Ad Knowledge. I forgot what year it was, 2008 or 2009. Then I started another thing. I started something called Ghostery. Jeroen: Yeah, I use that. David: Oh, you use it. Yeah, so I started Ghostery around that time, 2009. Then I sold it and now it’s owned by Mozilla in Germany. Then I started Performable which I mentioned earlier. Jeroen: Yeah. That all seems kind of in the marketing sphere somehow. David: Yeah, I’ve been in for 18 years. I’ve been in the marketing, sales and data analytics kind of world. Jeroen: Yeah, but that’s the first time you were in marketing more than sales and actually talking to people. David: Yeah, although you know it’s all related. Like at HubSpot, I built the CRM and built the sales productivity tools, the sales enablement tools – so that was there. But then too, the first startup, I was a part of the founding team, but not the founder. It was called Bolt, B-O-L-T. Bolt was one of the first social networks on the web. Again, we didn’t have the category social network so we called it a video website. We had millions of users which back then was incredible because they all had to dial up through modems to get online. In that case, we were building, we were bridging some of these same things, even though it was a social network. I mean, we built something that was like a thread list so you could create your own clothing. This was a long time ago, in 1997. We built something that kind of looks like Drift but we called it Zap. It was like an instant messenger but it was more than people just talking to each other. We built that back then. We built a lot of this stuff that now seems new but I’ve basically been doing the same thing for a long time. Jeroen: How does that feel? David: It feels like I’m finally figuring it out a little bit. There’s still lots to figure out. Jeroen: Yeah. How did you get into all of this? Like what did you do before getting into the startup space? David: Yeah, how’d I get into? Jeroen: Yeah, you’re an engineer by background if I’m not mistaken. David: Yeah, I was. Yeah, at that first startup, I was the chief software architect and built most of the software there and launched them and everything like that. When I grew up, my parents both worked for themselves. They were immigrants to the United States. So I always grew up wanting to start a business but I didn’t know what business was. I didn’t know why I had this concept in my mind. Because back then, this was before the internet, I didn’t have any role models that did any of this stuff. I didn’t know anyone who owned a business. So for some reason, I had this in my head and I always tell people that before recent history, before Mark Zuckerberg, nobody wanted to be an entrepreneur. This was not a glorious thing, to start a company. Entrepreneur, I didn’t even know that word when I first started. Starting your own business or doing what we do now in terms of a startup, was people would think you were a loser. Like why can’t you get a real job? Why can’t you work at a real company? This is not a thing that people bragged about. It was more of a thing that indicated that something was wrong with you or something was weird. But my wife says that I don’t like being told what to do so that probably had something to do with me wanting to start a company. I had some early mentors, kind of around college age, who were small business owners. I think they had a big impact on me, now looking back and that’s what led me into this world. I have an obsessive personality and I became obsessed with the early internet and it continues to this day. This idea of the kind of connecting everyone around the world, which we used to talk about in 1996 – that was what was happening with the internet. But it’s never as true as it is today. Jeroen: Yeah, I think maybe entrepreneur was not a thing but you could like to build stuff for yourself. David: Yes, that’s what I like. I like making something from nothing and that could be software, companies, whatever. But I just like the act of creating. That really, really drives me. It still does to this day – whether it’s creating flowers or creating companies, I like doing all of it. Jeroen: Flowers? You’ve created flowers? David: Yeah, I like gardening and growing stuff. I like everything. Jeroen: Right. When and what was the first thing you created and you were like, “I’m going to sell it” as well? David: Oh, that I was going to sell it? David: I’m trying to think. The first time I created something publicly was really the first website that I worked on. I worked on it while I was at school and that’s what fueled to do all of this. But the first time I tried to sell something was probably at Bolt. We created that and we were trying to sell advertising and all that kind of stuff back then. Jeroen: Your first website, you ended up selling. Was it the GeoCities website or some other? David: That was before GeoCities. David: Yeah, I hand coded, before GeoCities started. They were probably starting a little bit after that and then a couple of other competitors of GeoCities were starting that. But back then, you had to hand code it. You had to hand code your own website. Jeroen: Just some HTML code. Jeroen: That was it. Yeah. Jeroen: So you like building things. You have had a bunch of startups in the marketing space mostly. Were most of these bootstrap or VC funded? David: No. Only one of them was technically bootstrap. That was Ghostery. The rest of them have been VC funded, including Drift. David: The early ones, I think, Compete and a couple. Compete, I definitely thought about it beforehand. Ever since Compete, after we sold Compete, I’ve not thought about it and thought about it as funding it myself including Drift. My intent, in the beginning, was to fund it myself but like I tell people, the way to get investors interested in investing is to tell them you don’t need any money. That’s the truth and that was the truth in all cases. Jeroen: But you didn’t want them to give you money. Why did you end up having them give you money? David: Because, well, it depends on every case. In the case of Drift, which is the most recent, I’ll talk about that, it’s because we knew we were going to try to build an enduring company. We knew that we were building a SaaS company and by now, we had built so many SaaS companies that we knew the economics of SaaS. If we wanted to build a company at the speed that we wanted to build it and at the magnitude of how we wanted, it was going to take capital. It’s easy to get SaaS going now, very easy. But to really get to meaningful sizes, it needs capital because SaaS itself as a model consumes a lot of capital. David: It’s a personal choice for everyone. For me, at Drift, we took that capital day one. David: Day one. Which is unusual. Jeroen: But they want to have to want to give it to you, day one. David: They did so. Which is not always the case. But they did. Jeroen: What is it that you guys are doing at Drift nowadays. You just said before the talk that you’re very busy. David: Yeah, crazy. I’d say we’re pretty crazy right now. What are we doing? We’re trying to scale the company from a revenue standpoint and from a people standpoint. We started this year, the last year 2017, we started the year with around 20 people. We ended the year at 100 people. We started this year obviously at 100 people. We’re going to end the year with around 240 people. So therein lies a lot of stuff that we’re doing, right? Like a lot of hiring, scaling, training, onboarding and educating, making people effective, all that kind of stuff. Then trying to grow proportionally from a revenue size. We’re trying to 5X our revenues this year. Last year we 20X’ed our revenue. Of course, coming from a small number. But yeah, we’re trying to grow quickly. We’re fortunate in that there’s a lot of headroom in what we’re trying to grow. Jeroen: Yeah. In all of this, where do you fit into the picture? What is your role? David: I do podcasts like this one. David: That’s all I do! David: Yeah, I wish I just do that. What I do is, I spend most of my time trying to help other people reach their full potential and become effective. That has everything to do from spending time in hiring. I’m involved in every hire that we make, from intern to the highest level. So I’m in the part of that interview. So you can imagine that it takes a lot of time if we’re trying to have 140 people and everyone you talk to is not hired. That takes time. Beyond that, I work with our customers a lot. I spend a lot of time with customers. I spend a lot of time in the market and so I help a lot the between marketing and product. But it’s more on marketing than anything else because my co-founder here is great on products. So he’s taken over some stuff there. But I naturally gravitate towards product and now marketing. So I do our podcasts. I do videos. I do a lot of speaking. So I fly all over the place, all over the world, speaking, spending time with our customers, spending time with prospects. I’m constantly on the move and my days are not the days that an introvert like myself would dream of, right? I love every minute of it but my calendar is packed back to back on most days. But that’s what the business needs, right? It’s not like me doing deep work right now and putting some headphones on and just sitting in front of my computer. It is not going to move the company forward because I’m not helping anybody else, right? I’m not coding anymore. I don’t really have an effect when I do that at this scale. Jeroen: Yeah, so it’s all meetings for you, back to back, the whole day. David: Yeah, meetings or speaking with people or walks or stuff like that. So I hate meetings personally. I don’t have a lot of normal meetings but I do have a lot of one on ones. I believe a lot in investing in that. So we spend a lot of time, mostly walking around. Walking and talking. But in terms of meetings, with process and bureaucrats and all that bureaucratic process, no, we don’t have a lot of that. Jeroen: Yeah. So one on ones are mostly to align on the way of working or it’s mostly to align on what to do or how to do something? David: It depends. The way I think about it is and the way that we frame it is, the one on ones is owned by the person. So whatever our meeting was, it’s up to them to create that agenda. It’s their meeting. I’m just there to help them in whatever it is. So sometimes it might be some of the stuff you mentioned. It might be specific, how do I do something, the how. More often, it’s the ‘why’. Why am I doing something? Why should I feel excited about this? So I spend a lot of my time mostly there on the ‘why’ – making sure they’re excited. Making sure they’re fired up. Making sure they’re focused in the right areas. Less about the ‘how’ because they know the how better than I do. Jeroen: Yeah, I understand that. So it’s mostly one on ones. It’s helping on the marketing side also? David: Marketing, yeah, one on ones. The marketing’s a little different in that. I actually produced some of the marketing. So I’m on the video. I’m on the podcast, so that one, I’m on both sides of it. But from an idea standpoint and from a process standpoint, our marketing head, Dave, runs that. Jeroen: Okay. You’re the on videos, et cetera but you’re not actually the one strategizing for it. Jeroen: Are you writing stuff? David: No, not really. I talk more than anything else and then maybe I’ll transcribe some of that stuff. Jeroen: You will transcribe it yourself? David: Sometimes. Sometimes, someone else will do it for me. Jeroen: You mentioned that you’re spending your time on hiring now. Jeroen: You also mentioned that you’re going from 100 to 240. Jeroen: Do you think you will still be involved in every hire at the end of the year? David: I don’t know. I’m trying to figure that out. Jeroen: Does that sound feasible to you? David: At 240, it does because I did that before. At HubSpot, I grew my team to over 200 and I was involved in most of that. So I do think it’s possible. I do think it’s important. So yeah, this year, I will. Will I be in it next year? I don’t know. I couldn’t tell you at the top of my head what our growth target is for next year in terms of headcount. But it will probably be the same kind of doubling again. Jeroen: Yeah. That’s going to be an enormous amount of work if you want to be involved in everything. As crazy as that sounds – that sounds crazy to me; like they’ve never worked anywhere where this person would even talk to them. Forget about being in the interview with them. That has a meaningful impact. That helps in the recruiting process and it is the small things like that that people will remember and they will tell other people about. Jeroen: It also sets the culture somehow. It opens up the culture of openness and transparency when you get to talk to the CEO. Jeroen: You also mentioned you’re walking around. Is this also a way of getting people to open up and bring their issues to you? David: 100%. I always kind of coach people on my team to never have a one on one meeting sitting down in a conference room or in a meeting room or things like that. Because it doesn’t feel like a natural discussion. It feels like an interrogation, right? It feels like you’re being questioned by the police. The worst versions of these are when people sit there with a laptop open, writing everything, typing everything that you’re writing, or a notepad, writing every word that David is saying. It’s insane, right? There’s no way that you’re going to be natural or comfortable if you’re looking at someone writing down every single word that you’re saying. Instead, make it like a normal conversation that you would have with someone. Walk around with them, get a coffee. Just go for a stroll outside and just let them talk. I find that when you do that, people are more comfortable. People are willing to tell you things that they would not normally tell you in the other process. Jeroen: So you’re actually walking around doing one on ones? David: Oh yeah, 100%. I don’t carry any notebooks or anything. I write down nothing. Just focused. I’m just paying attention to them. Jeroen: Yeah, sounds like a cool job. You said as an introvert, it’s not really what you want, what you like to do all day. But walking around sounds good, no? David: Yeah, the walking around part. I’ll say I like that part. I like one on ones. It’s like big group meetings and stuff like that, that is not the best. Jeroen: Like town hall meetings and all. Jeroen: Do you do those? David: Yeah, we are going to do one tomorrow. So we do one usually the first Tuesday of every month. This one we delayed a week but we do those here. I give a lot of public talks so I do that all the time. Then we onboard new people. We have people start two days a month. There are two Mondays a month that people can start. On those days, we have, myself and my co-founder give like an hour-long kind of onboarding talk to those people. I give like half an hour and he gives the other half hour. So I spend my time there. That’s usually five to, I don’t know, from three to nine people depending on the class. Jeroen: What kind of other rhythms do you have in the business in terms of how long are the sprints set out? David: We don’t believe in sprints. David: No. Well, I should say I don’t believe in them. What we do is we let every product team decide their own cadence. We have something called the monthly marketable moment where we release something big from one of the product teams. Every month that is like a stand-alone product, almost. It’s huge. But those teams could work on that for a while. We have lots of teams working in parallel. But otherwise, we work on a daily cadence. We don’t work on this kind of artificial sprint thing. We work on this daily cadence and we have a methodology that we’ve created which is the ‘continuous development methodology’ and I’ve written about it in this book I wrote called ‘Hyper Growth’. It’s free on our website or you can get it on Amazon. It goes into details about it. But our cadence, otherwise, outside of that monthly meeting is that we have a Monday metrics meeting. So this morning we had a meeting. We have that at 9:30 am every Wednesday. It’s a 15-minute meeting. We don’t like to spend too much time in meetings. We just go over the last week’s performance across product, marketing, sales, support, success – every team. It’s really quick. It’s 15 minutes or less. We bookend that and we have all company meeting on Fridays. It’s called ‘show and tell’. It’s at the end of Fridays so it’s Friday afternoon at the end of the day and people have beers and it’s fun. In that, people show what they worked on that week. We started that tradition mostly for the product team so that they can show the customer stuff that they’ve released to the customer that week, and educate the rest of the team. Jeroen: For the how did we do part, if it’s only 15 minutes, how do you actually decide on how to deal with the metrics, like how to improve them or where does that happen? David: That happens. The individual teams work on that all week and how to make it better. We have one person who’s our VP of operations who owns the Monday metrics meeting and puts everything together. He decides on the flow of that meeting and he’s the only one that’s presenting. He’s doing a quick run through all the metrics. Right now, we’ve done it for so long that we have a pretty streamlined and effective method there. But the solution on how to fix things, those solutions don’t come from us, from me or from him or from someone else. They come from the teams. The teams have to decide that. Jeroen: Sounds good. What is it actually as the main skill or as a set of skills that you think you as a founder bring to the business? David: I’m trying to figure this out over the years. What am I actually good at. I’d say I’m good at zooming in, zooming out – that’s my style of management. I’m good at going into whatever the domain is because I’m obsessive about learning. I can learn things really quickly at a fairly good level, not the deepest but pretty deep. So I can go pretty deep because I’m so obsessive about stuff. So I can do that. I can zoom in and then I zoom out a lot and then I work at a very high level. So what that looks like every day is that I’m good at or I’m decent at the high-level stuff and I spend a lot of time there and we talked about some of that stuff. Then I zoom in at a very low level – like having interviews with people, giving product feedback, giving marketing feedback and then I zoom back out. That’s kind of my skill now. I can do that easily. I spend no time in the middle, like how do we solve something and how do we do that. That’s for the teams to handle. I work at the very high level and on the very low level and I care about every single detail like moving to a new office. I care about what do the colors look like, what does the layout look like, what does the experience look like, how will it feel for a new person coming in? Just all sorts of little details that people overlook. I spend a lot of time thinking about those and remain worried about those. Jeroen: Then someone else makes it happen. David: Yes. They decide on how to make it happen. Jeroen: Yeah, got it. If you say you’re obsessive about learning, how do you go about it? How do you usually learn stuff? David: I’m super hands on. So I read a lot. David: No blogs. Books. Books, videos, audio, that kind of stuff, but usually long form – mostly books and from mentors. So I have a lot of mentors and role models and people. So I spend a bit of my time to just go and meet these people who are ahead of me. Mentors that I have, learning from them. I used to read a lot of blogs and stuff like that but most of that information is not great. It’s not useful, so I stopped doing that. What I look for now are lessons from people who are 10, 20 years ahead of me and have lessons that have stood the test of time. I also look at books that have stood the test of time. So I’m not necessarily reading the newest book but I’m reading the books that have been around for a while and have kind of lasted. So I’m looking for those things that have stood the test of time. I find most blogs and stuff are very low, little detail and very much a fad in how they wrote things and so I don’t actually spend a lot of time doing that anymore. Jeroen: Yeah, so what are some of the books that we have to think of when you say books that stood the test of time and who are your mentors? David: I have so many. Well, I have a number of them. They’re always changing. I have my first three mentors, all had the same first name, Sam. Yeah, one of them was Sam Lee and he was a guy who was a mentor to me from high school to college. He was the first kind of successful multimillionaire person I had ever met in my life. An immigrant from Taiwan. Started a bunch of wholesale businesses in New York where I grew up. Then my second mentor was also named Sam and he was a virtual mentor. I believe in virtual mentors a lot. That Sam is Sam Walton and that was through the book. I’ve everything I can on Sal Walton. He started the company called Walmart and I loved his book, ‘Made in America’, that’s a required reading here at Drift. Then my third Sam is called Sam Zales. He has been a part of many successful companies and a COO of a public company called CarGurus here in Boston and I got to spend time with him. I have other mentors besides those but I’ll start with those three. Jeroen: Cool. What is the latest good book you’ve read and why did you choose to read it? David: Oh my goodness. I’m always reading something. I read so many books that I often have too many to recommend. If you ask me for a book recommendation or what was the last good book I read, I’m always stuck. There are three books that I give to every person at Drift on the management team. Because these are the three books that I think have shaped the way that we think at Drift the most. One of them is, I mentioned already and it’s called ‘Made in America by Sam Walton’, so that’s the story of Walmart. The second book is called the ‘Everything Store’ and it’s about Amazon. Then the third book is called ‘Built from Scratch’. That book is the story of a company called Home Depot, which is a big company here. I didn’t do this on purpose because all the three books are about retail. Jeroen: That’s what I was about to say. David: Yeah, it has nothing to do with what you would think that I do. But they’ve had the biggest impact on the way that I think and that’s why I give those books out and ask everyone to read those. The reason I think so is that lot of what Drift does and the thing that I’m obsessed around is creating this most customer-centric company possible. All of these books, because they are retail, they have to be customer-centric, right? Because they’re dealing, that is the retail business, is just dealing with your customer. So all three of these books are good models in building customer-centric companies and that’s why they’ve had a big impact on me. But I’ve read a million, million, million other books that I can recommend and one that I’ll just shout out, that if you’re looking for trying to be the best version of yourself, it’s a book called Peak Performance and is written by Brad Stulberg, fantastic book. Brad is actually a personal coach of mine, so I’ll disclose that. So he coaches me and we have calls a couple of times a month. Jeroen: Now back to the three books. I’ve read the one on Amazon myself. The one about Walmart is on my list. The one on Home Depot, not yet. I’m seeing that they are very customer-centric and that can inspire you. But what are some lessons you would, for instance, take from the Amazon book that you’ve implemented at Drift? Because that I have a hard time seeing. David: You have a hard time seeing that? Jeroen: Yeah. Like at the top of my head. David: Yeah, Amazon is probably the most formative kind of company in terms of Drift and how we think about things. At the end of the day, because what you see of Drift today is chat, sales – you see that kind of stuff that you mentioned at the beginning. But fundamentally, what we’re trying to do at Drift, kind of our long-term vision is that we’re trying to create the new way that businesses buy from businesses. So because of that, there are a lot of things that are more related to Amazon than you think, at least from the retail side of things. Because Amazon is fundamentally the way we all buy from businesses as consumers. So we’re trying to look at the models that they have and trying to see which ones of those can we take and learn from, which one of those are not applicable and how do we use these. Because of that, there’s a lot that overlaps. It’s like if I just think about the way that we train people inside of Drift on marketing, right? In marketing, we talk a lot about or I talk a lot about cognitive biases, social psychology, how do people make decisions to buy things, etc. The best example or one of the best examples that you could use is to go look at the Amazon product detail page, right? If you’ve been buying from Amazon for as long as I have, since the beginning, since they started actually, you’ll know that the product page has not really changed much. The design has advanced a lot but it hasn’t changed much. One of the reasons I believe that’s true is because it’s like the perfect page from a social psychology standpoint and we’ll use that page as an example for our marketers to teach them about things like scarcity, right? Where do you see that on that page? You see that if you look at the page and it says, “Hey, you get free delivery by Wednesday. If you order within eight hours and 13 minutes, you’ll get this at your house by Wednesday.” Or you’ll see little things that will say something like, “Only three left in stock. Order now. More coming soon.” So that’s scarcity. Then you look at things like social proof, right? It is another way in which we make our decisions. Then you can see the customer reviews on all the product pages. You can see the customer images that people have uploaded, the videos that people have uploaded and all those things are social proof for a product. You can see how high this thing ranks in terms of being the best seller – again, social proof. So I can continue on and on but there are so many cognitive biases that this page can have when we count; can have anywhere from five to ten different cognitive biases all working at once on this page. Why it’s so successful, is an example for us in marketing. Jeroen: Yeah, I can see how it can easily translate to market. Does it also inspire your products or your company? David: Oh, it definitely does. There, we have very similar kind of leadership principles that they have – obviously about being customer-centric. About seeking out the truth about having a bias for action, right? That is important to us. But they are similar in the mechanics of how that works because at the end of the day, we are people who are buying on Amazon and whether you sell B2B or not, you’re still a person buying from another person. Jeroen: So Amazon’s recommendation engine and Drift’s, share both or one and the same thing in the end? Jeroen: Cool. Just as the last question, not the easiest one, what’s the best piece of advice you ever got? David: Oh my goodness. That is a good question. No one’s asked me that, I’m surprised. What is the best piece of advice? Probably, the one I’m just coming up with at the top of my head is sleeping on it. Sleep on it. We all want to jump and react and give an answer to something right away. But often, the best answer is just to sleep on it and come back to it. Jeroen: What are some of the things you sleep on? David: Oh, I use the ‘sleep on it’ technique with every hire that we make. So every person that I talk to, I don’t give my opinion on the conversation to the hiring manager until the next day. I let myself sleep on it. That often gives me the right answer, because you can have yourself become very excited during the interview process because they were funny and you talked to them and you need someone in this role and blah, blah, blah, all those things. Then you might end up with the wrong answer. So I sleep on it. If I still feel excited the next day, then that’s the right answer. Jeroen: Cool. Thank you, David, for being on Founder Coffee. David: Thanks so much for having me. This was awesome.